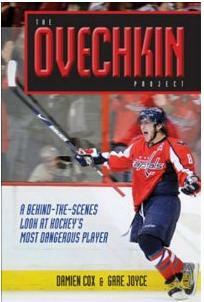 It is a safe bet that Gare Joyce and Damien Cox's new book The Ovechkin Project: A Behind-the-Scenes Look at Hockeys Most Dangerous Player.will be one of the best selling hockey books later this year. JP over at Japer's Rink already has excerpts from the unauthorized biography coming available this week. Be sure to check out the critically acclaimed Japer's Rink for more.